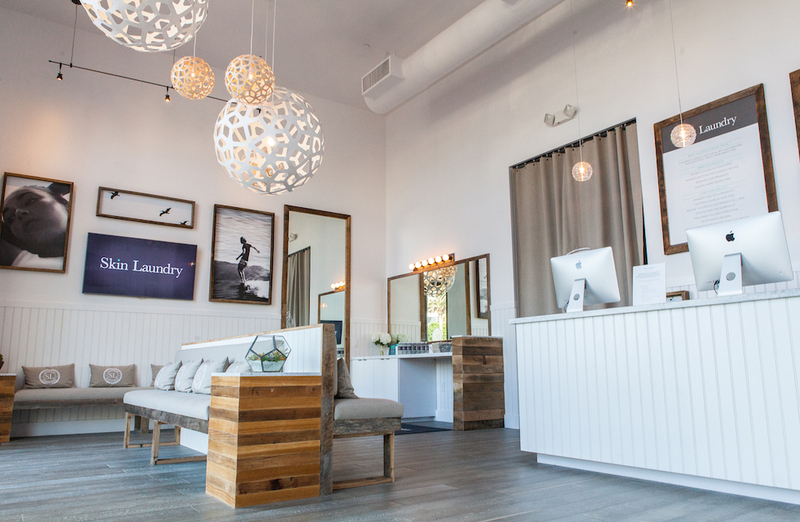 Skin Laundry facial review – so fresh, so clean? Think how easy it is to clean your clothes – stick them in the washing machine, job done. Now if only it could be that easy to clean your face… cue cleansing, toning, exfoliating, extracting and heaven knows what else. Well, that’s where the Skin Laundry comes in. This high-tech beauty blitz is a laser and light facial that claims to get the job done in just 15 minutes. Having won rave reviews in the States, it’s now landed in Hong Kong with three bright and breezy locations – in Lan Kwai Fong, Lane Crawford in IFC and Repulse Bay – so I was curious to give it a go. Brighter, firmer, smoother skin with reduced pores and diminished lines in less time than it takes to pick my latest nail polish colour? Sign me up! 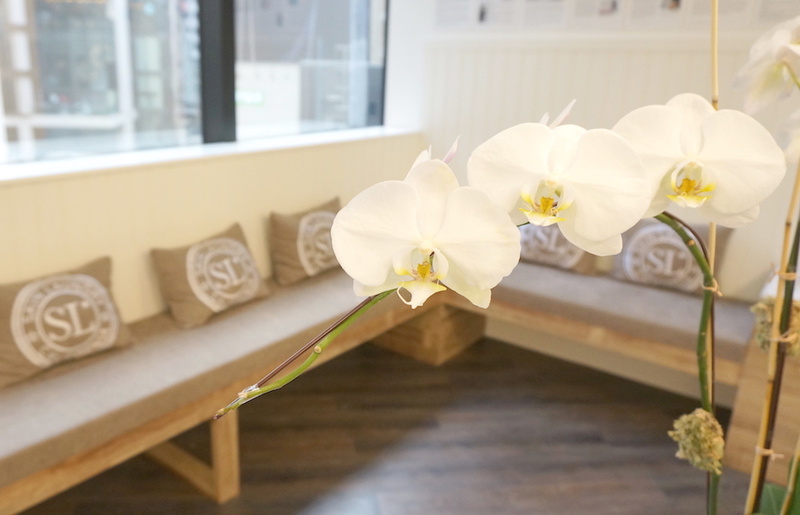 Now for the science bit… rather than various lotions and potions, The Skin Laundry facial uses laser and IPL light technology to deep clean your skin. All you have to do is lie down, stick on some safety goggles and your Skin Laundry technician will do the rest – namely rub two little machines on your face in a few sub-one-minute blasts. 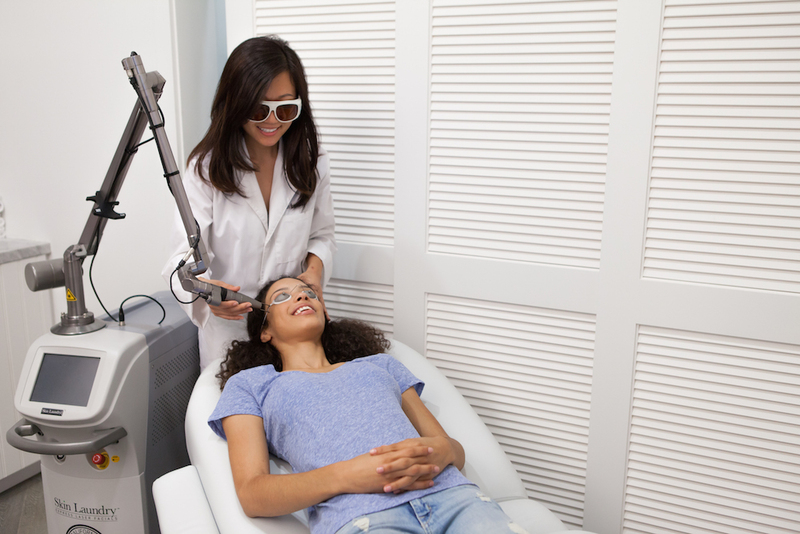 Your technician talks you through the whole experience so there are no sudden shocks – well, unless you’ve never had laser treatments done before like me, in which case the two blasts of laser are a shock in themselves. It is NOT pleasant. I’ve heard the usual talk about laser feeling like an elastic band snapping against your skin but honestly, I would compare it more to a blister of uncomfortable stinging pinpricks except with intense heat and a disturbing burning smell factored in just for fun. I probably have more sensitive skin than most (and it definitely hurt more on the delicate parts of my face, like my cheeks and lip area) but this couldn’t be over quickly enough in my book! By my second Skin Laundry treatment though, I did find the laser less painful, though still distinctly uncomfortable. 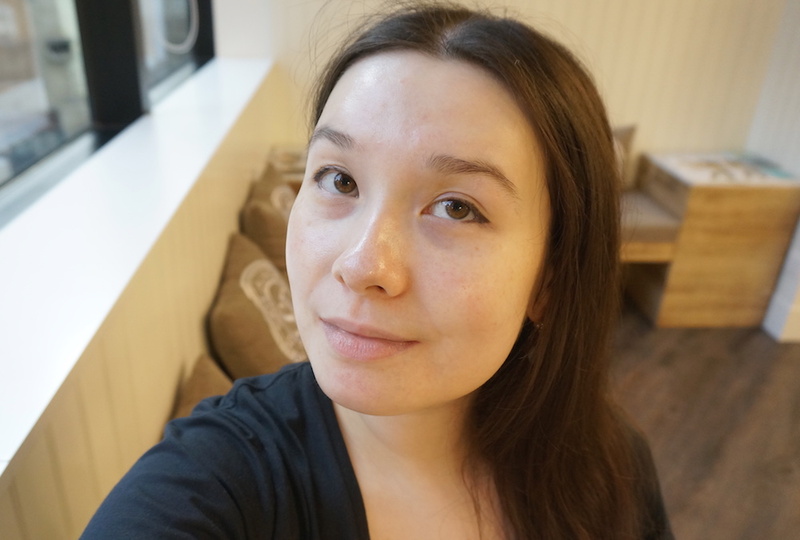 The second part of the Skin Laundry facial is IPL (intense pulsing light), which I have had done on my legs before and knew wouldn’t hurt at all – seriously, I’ve had more uncomfortable naps, it’s that pain-free. A thick cooling gel is applied to your face so you don’t feel the heat whilst the goggles protect your eyes from the light; it feels more like a very gentle quick, albeit Star Trek-esque, facial massage… And that’s it, job done! The Skin Laundry official line is that the treatment takes 15 minutes in total, but ten is probably closer to the mark. The laser and light show isn’t just for Star Trek brownie points however; this technology is supposed to instantly vaporise dirt and bacteria, brighten dull complexions and tighten the skin. There are also supposed long-term benefits with regular Skin Laundry treatments, including boosting collagen production and reducing the appearance of sun damage, fine lines and wrinkles, pores and scars. As for me, the results from my first treatment at the Lan Kwai Fong branch were… precisely nothing. I actually didn’t bother taking an “after” photo as I looked exactly the same as the “before” shot shown above – namely a bit dull, puffy and blotchy. Things were to get worse though; the next day, I suffered from a series of patchy breakouts. The fact that I very rarely break out did seem to suggest the two events were related, so I’m afraid I wasn’t really feeling the Skin Laundry love. However, the Skin Laundry’s founder Yen Reis was pretty adamant that the real benefits come from continued treatments, so I decided to give it another go, this time in the treatment room at Lane Crawford… and I was glad I did because this time, the results were stellar. Just check out my “after” shot below with no makeup (other than eye makeup which because of the goggles, is the only makeup you can keep on during the treatment – thank God, as my eyeliner would have to be prised from my cold dead hands); as you can see, my skin is noticeably brighter, tighter and definitely a lot more evenly coloured. 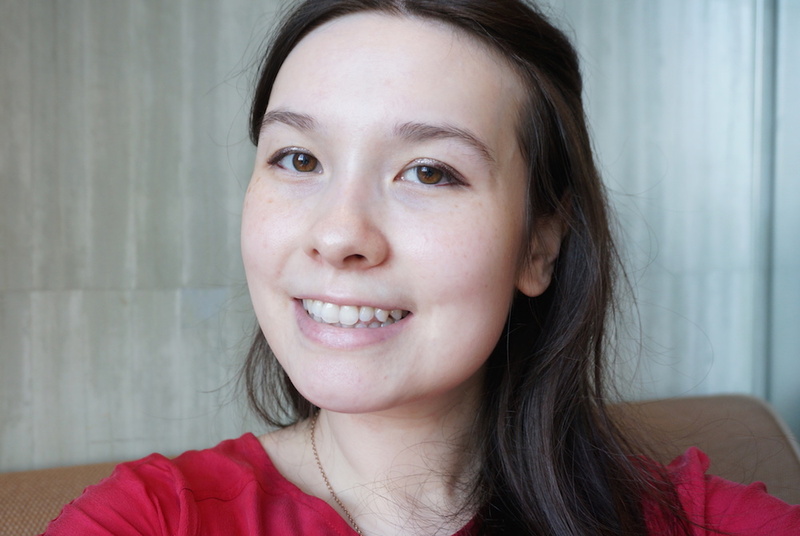 It was so good in fact, that I went makeup-free for the rest of the day… #nofilter that, baby! If every time I had a Skin Laundry facial, I was guaranteed results like my second treatment, I wouldn’t be writing this now; instead, I’d spending my downtime getting my face zapped there all day, every day for the rest of my life in return for flawless skin. However, my initial disappointment with the first treatment alongside rather mixed feedback from friends (some loved it, others didn’t notice a difference, and a few like me reported wildly different results from their first and second treatments) made me feel this was a bit too hit and miss for my liking – and at $550 a pop for only ten minutes of action, I’d want a much more sure bet. I’m a firm believer in the fact that everyone’s skin is different – and even the same skin is different at different times of the year – so to be honest, I’m not that surprised that the Skin Laundry’s one-treatment-fits-all approach doesn’t… well, fit all. The blasts of laser and IPL are the same for everyone and unlike other treatments I’ve had that have involved a bit of high-tech machinery (like The Peninsula Spa’s Ultimate Aesthetic Facial Treatment by Margy), there are no relaxing facial techniques or luxurious skincare products to give you that guaranteed post-facial glow. Given I’m a bit of a spa junkie, I would personally prefer to splash more cash but less often on a full-on facial at a luxury hotel (like at the Ritz-Carlton Hong Kong Spa or Landmark Mandarin Oriental Spa) where I’d also get bonus heat and water facilities, a swanky relaxation room and refreshments on-tap! That being said, everyone currently gets their first Skin Laundry treatment FREE, so I do think everyone should at least give it a go to see if it works for them – and if it does, lucky you, because there are some very well-priced packages available if you buy a series of treatments upfront. And if you’ve tried it, love it and are confident that it does do the trick for you, it would definitely be an easy and convenient ten minutes to fit into your schedule or a great quick fix option if your complexion was feeling ultra clogged (which given Hong Kong’s pollution levels, is pretty often) or before a party or special occasion. So now it’s not only your clothes you can take to the laundry… although I’m not sure what the tumble dryer equivalent is! And if you have already got laundered, let me know how your Skin Laundry facial fared in the comments below! 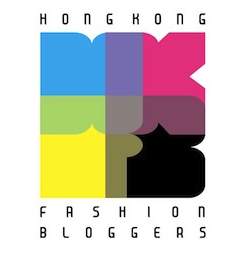 This entry was posted in Beauty and tagged Beauty, facial, fast facial Hong Kong, IPL facial Hong Kong, laser facial, laser facial Hong Kong, quick facial Hong Kong, review, Skin Laundry, Skin Laundry HK, Skin Laundry Hong Kong, speed facial Hong Kong, ten minute facial Hong Kong, where to get a facial in Central, where to get a facial in Repulse Bay. Bookmark the permalink. I think you’re very brave to let your face for experimental trial of this kind! No worries – haha yeh I agree it was definitely painful but at least over relatively quickly! I’ve known some people to rave about it from the first session and others like me and your friend who had no noticeable difference – so no harm in taking advantage of that free first trial to see which camp you fall in! How far apart were your two treatments? Your skin looked so much brighter after the second treatment – but did you take a before photo for comparison? And how long did the results last for? Hi Sofia – thanks for reading! The treatments were around a month apart. For the second treatment, the “before photo” was pretty much the same as the first “before photo” which is in the review. For me, the results didn’t last as long as a good spa facial (the best was the Margy’s Facial at The Peninsula, which is also sadly one of the most expensive!) – only really a few days if that, for the really bright skin you see in the after photo – which is why I think the Skin Laundry facial would be a good quick fix option before a special occasion if it works for you. Hope this helps!